Packages are like addins for Dynamo. Packages are created by users like you and shared locally with colleagues or with the world via the Dynamo Package Manager. Packages may contain a single node or a full library of nodes that you can use in your own Dynamo definitions. 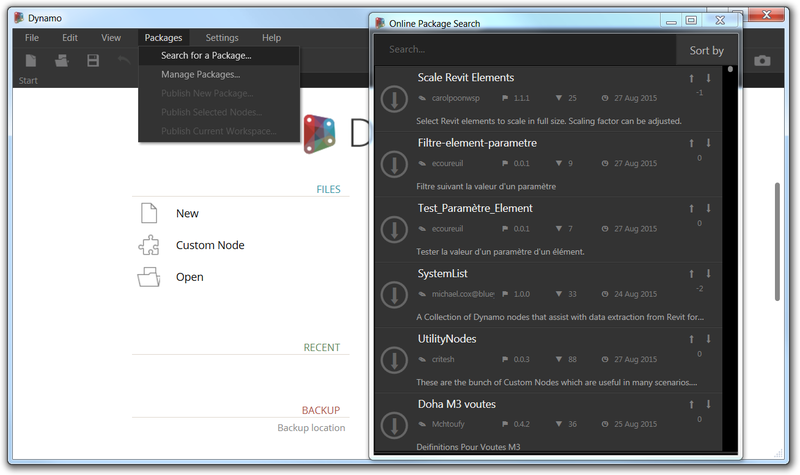 The best place to find packages is the Dynamo Package Manager, available from within Dynamo in the Packages Menu. Choose “Search for a Package…” to browse through available packages with descriptions and access to older versions. Choose the option to install packages you would like to use from this menu, and the files will be downloaded and placed in the appropriate place on your hard drive so that Dynamo can access the new functionality. If a package has a dependency on other packages, those will be downloaded and installed as well. Package files can also be downloaded manually from dynamopackages.com, but if you use the package manager, Dynamo will take care of all the file paths and content loading for you. Find options to manage the packages you have installed under the “Manage Packages” option in the Packages menu. Most notably, some packages contain sample files that you can access easily through the Manage Packages dialog. Click on the menu option for a particular package and choose “Show Root Directory.” If the package has sample content, you’ll find it in the “extra” folder. Uninstall a package or update a package to a newer version through other options in the Packages menu. Most packages will appear as a new library called something similar to the package name. Authors have the choice for how to organize these nodes, however, so note that nodes may also appear in existing libraries like Core or Revit. Packages, like other custom nodes, are external files. When you share a Dynamo file with someone else who may not have that package or that custom node installed, you will see a warning that Dynamo doesn’t know what’s inside. Once you have the custom node file or package installed, the warning will go away, and the Dynamo file should act as it did before. To publish your own package, first make sure you are signed into an Autodesk account. You have this ability if you are using the open-source version of Dynamo on top of Revit or from Autodesk Dynamo Studio (the standalone version of the open-source version of Dynamo does not have an ability to sign into an Autodesk account). 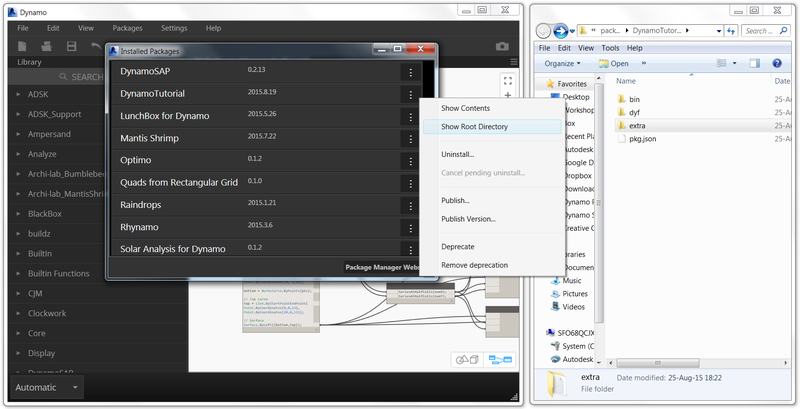 Once you are signed in, follow the prompts after choosing “Publish New Package” in the packages menu. When it comes time to update your package, chose the “Publish Version” option for that package in the Manage Packages dialog.